I'm attempting shed my QuiltCon cocoon for the year this week, albeit with a nasty cold...all the while, working on building a new one for next year, but at least the crazy level of work is months from now. It's nice to have a bit of a breather at this point with work, at least a tiny one, for a few moments, but holy wow, there's so much to catch up with you all on. Let's see, where to start...let's start today with cross-stitchy fun. no pattern - I drew it up myself! I even taught my son to cross-stitch this weekend using a super cute kit I stumbled upon at Fancy Tiger that I cannot recommend enough - Cross Stitch Friends. He's seen me cross-stitch for a while, and this was just the project to hook him with! Checking Instagram the last day or two has been sheer torture. Photos are flooding in from QuiltCon, and gosh, I wish I were there. I am lucky enough to have a few pieces of me there at QuiltCon, but gosh I wish I could be there to take it all in. The next one will be in 2015, and I definitely plan to be there! 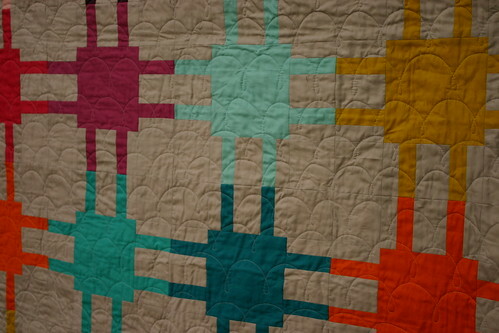 One of my quilts on display at QuiltCon is featured in the Modern Quilts Unlimited booth, #308. Modern Quilts Unlimited is a fantastic new modern quilting magazine, and I was super excited when they selected one of my designs to share at their booth. 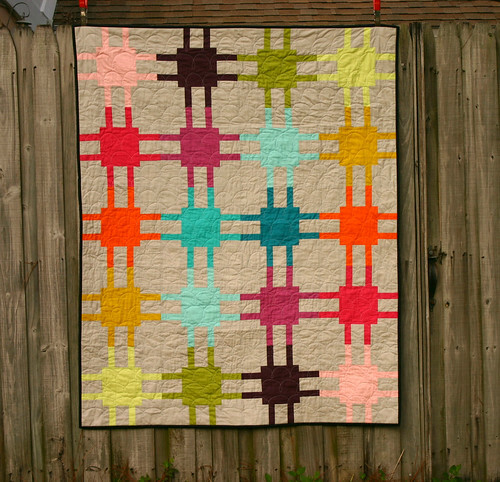 This quilt is something I designed a while back, while dreaming of rich Art Gallery solids, and it was a lot of fun to finally put it together. The Art Gallery solids I used for this project are: Crystal Pink, Cabernet, Dark Citron, Light Citron, Cherry Lipstick, Festival Fuschia, Fresh Water, Empire Yellow, Burnt Orange, Tile Blue, Emerald, with Mystic Gray for the background and Caviar for the binding. You can find Art Gallery solids in stock at Intrepid Thread and Stash Modern Fabrics. 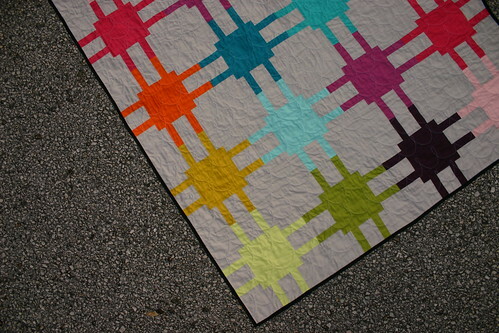 This is also the quilt that I used my Clamshell Loop FMQ design on, the one in the tiny sneak peek photo! 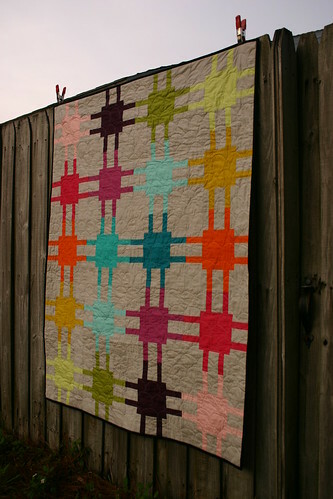 This was the first larger quilt that I used that FMQ technique on, and it was really fun and easy to do.